Includes: • 7 Overnight Rooms (sleeps 22) More can stay at no extra charge. 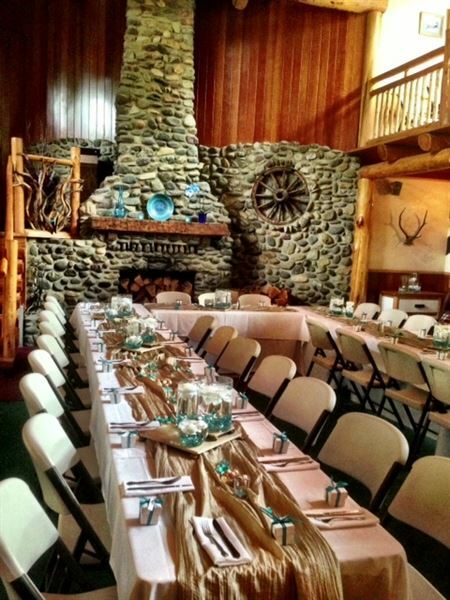 • Use of the space from noon the day of the wedding until 11:00 the following day • Indoor or outside spaces - The Great Room is available year-round. • Catering from restaurant next door. Menus can be customized to meet your needs. • Dinner served on glass plates with linen napkins, silverware and servers. • Coffee, Iced Tea, and punch are available throughout the day. • Wedding Coordinator • Tables & Chairs • White Linens • Setup & Clean up • Full Bar with licensed bartender We are fully licensed and insured. * We don't allow any outside alcohol to be brought in. * We do not provide flowers, center pieces, cake or decorations.